Pictured at a reception announcing a $500,000 legacy gift from the Gordon C. and Milred R. Jackson Foundation to Pleasant Valley Hospital’s “Building for the Future” campaign, are, from left, John Musgrave, Pete Allinder, Dr. Suresh Agrawal, Glen Washington, Jack Fowler, Dill Battle, Mario Liberatore and Christy Crowell. POINT PLEASANT — On Wednesday, officials with Pleasant Valley Hospital announced receiving a $500,000 legacy gift from the Gordon C. and Mildred R. Jackson Foundation to establish a new Children and Family Diagnostic Center. 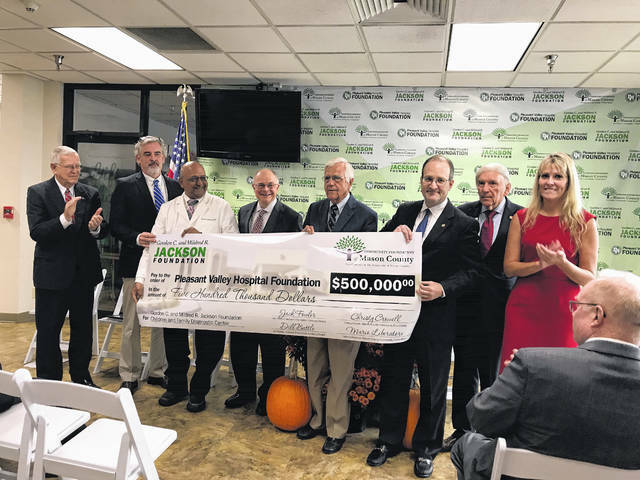 The announcement was made at PVH during a reception attended by administrative staff and personnel from the hospital, the Jackson Foundation, The Mason County Community Foundation, Cabell Huntington Hospital, local elected officials and supporters. The money will go towards PVH’s “Building for the Future” campaign which hit a major milestone in its $3.25 million capital campaign with the gift. Hospital officials say this “generous donation” will ensure establishment of the Children and Family Diagnostic Center at PVH. The center will be located within the current facility and be named The Gordon and Mildred Jackson Foundation Children and Family Diagnostic Center in honor of the couple, who, “so generously provided for the community they loved through their estate gift,” according to a statement from PVH. Through a partnership with the Mason County Community Foundation, PVH has launched its capital campaign to provide cutting-edge diagnostic service to Mason, Meigs, Gallia, Jackson and Putnam counties, the statement from PVH added. The gift is the first to date for PVH’s “Building for the Future” campaign. Washington also talked about PVH already making a down payment for the first phase of the campaign with two, state-of-the-art CT scanners and upgraded digital radiography acquired. Dr. Suresh Agrawal, chief of radiology at PVH, spoke about how the gift from the Jackson Foundation will affect the facility, focusing on the new CT scanners. Agrawal said with new “utltra fast, digital radiography” there would be shorter wait times for results, and reductions in radiation exposure. The fact that PVH didn’t always used to be in existence was brought up a few times, with references to the empty field where the facility now sits, as one of its early champions, Dr. Jack Buxton, sat in the audience. Buxton was singled out at the reception for his efforts. Today, PVH is Mason County’s largest employer. Pete Allinder, from the PVH Board of Trustees, closed out the reception and said he never remembered PVH not being in Point Pleasant, as he was born at the facility. He brought up the old grocery store that used to sit where the Wellness Center is now, directly in front of the hospital.